Yet another post from the "wait to post photos of gifts until after Christmas" category. I made gifts for both my nephew and niece and wanted to share them, especially as they are all firsts for me! The first is a pillow and cover for my niece. I have had these FQs of Birch Storyboek fabrics sitting around waiting for a perfect project ever since I received them from Green Bag Lady. Turns out a gift for my little niece is perfect! I made her a pillow form and an envelope-backed pillow cover. I used the tutorial from Cluck Cluck Sew, but left out the appliqued front. I did applique a letter P on the back for her name though. The second project is a felt crown for my nephew. I started this on a whim about a week and a half before Christmas because he mentioned he wanted a crown to go with his tutu (see below). So I made him a very boyish crown with his initial, along with a rocket ship, the moon and a star. My sister and I browsed a lot on Google images (and there are some great ones there if you crochet) but I based mine on the ones made by Maureen over at Maureen Cracknell Handmade. I have wanted to make one ever since I saw hers. The third project is a tutu for my 3 year old nephew. His friend had one at her house and he adored it, so my sister mentioned he would like one. I found a really easy tutorial at Skip to my Lou. It is still a bit serendipitous to me that a headband fits a toddler's waist. I mixed some purple, fuchsia and white to make a rather riotous tutu. My nephew loved it and wore it with the rocket ship crown, which was adorable. These were all so fun to make, and it was nice to challenge myself with new projects and mediums. I like having these excuses to break the mold! I did not want to post pictures of my finished Little Apples quilt until after Christmas, because it was a surprise gift for my mom. But now I am happy to share, because this is the quilt I am most proud of yet! It is the largest one I have ever made- I went to a local shop, Modern Domestic, to quilt it because their space is larger and their machines are much nicer Berninas compared to my little Brother. My mom loved it! This was the gift I was so excited to give this Christmas, and I am so happy to give it to my mom. Finished size: 60" by 52"
Quilted: on a Bernina 450 using a fan or sunbeam pattern (? )- no idea what to call it, but credit to my husband for suggesting it! Stockings! I have been wicked busy sewing for Christmas- thus, very little blogging but lots of progress on projects and presents. This means, on the off chance that someone who will receive one of these gifts is reading (and my readership is pretty low, but a fair majority are family!) 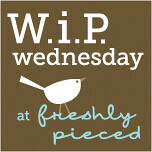 I have to wait to show pictures until after the gifting days- so check back for some wonderful finishes after Dec 25! As for the pics I can show though, I finished two stockings, one for me and one for my two year old son. I made mine first because I had never made one before and had to make up the pattern. I am glad I did, because it is about half the size his ended up being! Way too small for someone with lots of stuff in a stocking! I vaguely used the free All the Trimmings Stocking pattern available from Denyse Schmidt Quilts, but mostly just for the construction guidelines. I don't have a printer, so I just eyeballed my pattern. I love how they came out! For mine, I used the Heirloom fat eights I won from Stitching by Starlight. Thanks again, Angie! Hopefully they will hold up well to stuffing on Christmas Eve! Happy holidays to everyone reading this, and I hope your sewing and crafting is well received, as gifts or in your own home! Sew Modern Monday post- hope this counts! 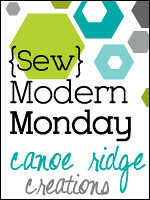 Okay, so Sew Modern Monday at Canoe Ridge Creations is for modern sewing finishes- a finished quilt top counts right? I hope so, because I am posting- so comment to warn me if it doesn't! I am itching to share though! This is the improv quilt I am making from Art Gallery fabric scraps sent by Pat Bravo for Project Linus quilts. These fabrics were a blast to work with, and it was a great challenge for me to sew a project using just these scraps. So great a challenge in fact that I failed just a bit. I had to use some Kona snow yardage from my stash to make up the quilt backing- the remaining scraps Ms. Bravo sent were too skinny to make it up. Cheater cheater me. But hey, they were my rules that I broke. One last bit- a rearrangement of my to be done Little Apples string quilt. I will need to add borders too. My Little Apples blocks are ready to be made into a quilt top! I am excited to get this ball rolling, as I hope to give this as a Christmas gift this year. 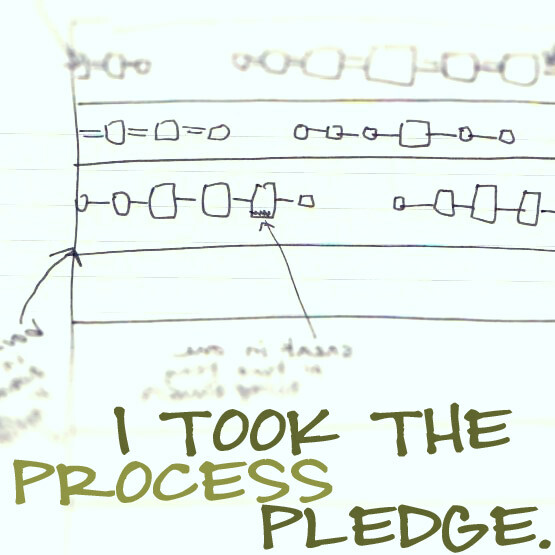 Plus, I just love to complete a project. I think the quilting should go easy too- I plan to just to straight line quilting in random arrangement across the entire quilt top. I think this will be best considering this is the largest quilt top I have made to date, I am quilting it on my machine at home, and there are all kinds of lines on this quilt already, so no need to distract any more! It is already quite busy, though I am liking it this way. I would like some opinions though. I have not started piecing because I do not have a 1/4" quilting foot (horrendous, I know), but I did all the blocks without one...will it make a difference? What color for the binding- grey, red, the dark green or turquoise from the blocks? Also, just to add things to a list already chock full and unfinished with the holidays so close, I signed on to make a quilt for Project Linus through Pat Bravo's blog. She sent out bags of scraps to volunteers, and I started cutting into mine and arranging by color to do a quilt from Fresh Quilting- Nate's Quilt. I love the idea of improv piecing and hope that makes it come together pretty fast. The scraps are gorgeous by the way- even if I mess up the quilt design someone is going to love this quilt just for the fabrics! Thanks for the materials. Art Gallery Fabrics and Ms. Bravo! This was not my first quilt, or my first baby quilt, but it is my first quilt I made for my baby. I wanted my son's quilt to be colorful and beautiful. Though it seems counter-intuitive to add a lot of white to a baby quilt, I could not resist the look. And it has stood the test of time, wash after wash. He sleeps with it every night in his bed, and it comes with us on trips, even just for a nap at grandma's house. The backing I found at my LQS and could not resist the perfect blend of green and yellow. Here's a closeup of the fabric, and my mixed yellow binding. That has become an accidental signature- my binding is never long enough in the fabric I pick, so there is almost always a little piece added! A full shot of the front. I adore this quilt. But not as much as I adore the little boy I made it for. I think I love it extra because of who it was created for. Finished measurements: 36" x 42"
Thanks for reading through my favorite quilt story! This was really fun, it all came together in a day (luckily a very sleepy day for my son) and he wore it yesterday for a zoo Halloween scavenger hunt. The wings need to be adjusted to stay on better, but he loved to wear the hat. I used this Martha Stewart baby pattern as inspiration, but drew my own wings and followed the instructions very minimally. The next project was a first trip to the pumpkin patch, and then carving pumpkins. I went for the bird theme whole hog this year and chose to do an owl. I used a Dremmel tool specifically made for carving pumpkins, which I highly recommend! It was a blast and so easy, but I did get little bits of pumpkin all over my arms. Shower after the carving, not before. And the third reason for my lack of blogging? I want to use all my free time to see how this Little Apples string block quilt is going to turn out! I get about 2-3 blocks done a day, but I am getting anxious! I've got a nice pile going, but I have a lot of my jelly roll left! I can't wait to start laying it out. Best of luck to all for the coming week, getting through a sugar-fueled late-night holiday and getting some sewing/crafting/work/relaxing done! Hello to my readers! I have moved to my new city of Portland, Oregon and am somewhat settled in, enough to be sewing once again and trying to get back into my groove. Most of my time up to this point has been focused on moving in to our new house and playing with my son. His sleeping times have been occupied by unpacking and organizing, cleaning and relaxing with my husband. And looking for a nice modern not-too-expensive couch (no luck on the last front). This is my color-organized bookshelf- can you tell I missed my sewing/quilting? My new sewing area- smaller, but hoping this smaller footprint will make me more organized! These are the selvedges- don't they look interesting in this little bunch? This is an Heirloom bundle I won from Angie at Stitching by Starlight, from her 10 for 10 interviews, which if you missed are still on her blog. My first fabric winnings at my new house! This I received before I left Cali but forgot to mention it here in the madness- this is a Storyboek fat quarter bundle from Birch fabrics, which I received from the Green Bag Lady. These are beautiful and soft- now I just need a plan for them! More to come soon, but for now, I need to get back to stitching my Little Apples! My two quilts to donate- now going to two kids who need them! One of these is for you, Diane! I will be taking these to Doernbecher Children's Hospital to donate to the chemo ward. We had a close friend whose son was treated there and I would love to give some handmade comfort to those brave kids during their often lengthy treatments. Had to post my WIP Wednesday, I guess it is now ingrained in me. So I will make this one different too. I feel the need to post it since it will likely be my last post for a month or so. I will not be doing much sewing to report on, because I will need to be packing- just found out I will be moving to the Portland area in two weeks. So here goes my progress before I have to pack up my sewing room! My banners/bunting are finished! One for each of two boys, and finished up and ready to go to their new home. This was a fun and relatively easy one! Pinned and the machine is set up to quilt this one at naptime today. If I only finish one, just one more going to 100 Quilts for Kids, so here's to being really good and finishing both! It'll be a while, so I'll see you all on the flip side (of October).